INDE – Kochi - The State Department of Archaeology is likely to shift a few centuries old gravestones kept at the Mural Arts Museum in Thrissur to the Renaissance Museum being set up at Bastion Bungalow in Fort Kochi. 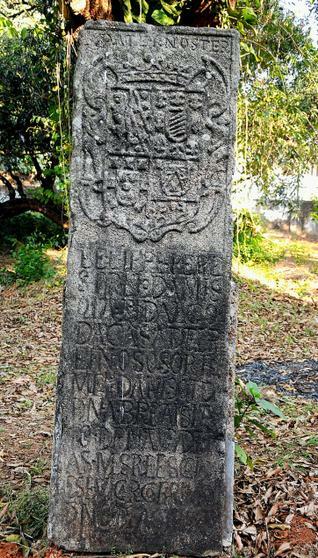 “Six gravestones remained without proper care at the State museum in Thrissur. They were shifted to the Mural Arts Museum last year,” said B. Balamohanan, documentation officer with the Thrissur unit of the Department of Archaeology. The inscriptions on the gravestones have not been completely deciphered. One of them is believed to have a Sri Lankan connection. The gravestones date back to the 16th and 17th centuries and are believed to been brought from Kodungallur, once occupied by the Portuguese. According to records, they were brought to the State Museum by Paliyat Anujanachan, an archaeologist, in the early 1940s. They are soon likely to be a part of the Fort Kochi museum, which will focus on Kerala during the renaissance period: from 1800 to the mid 1980s. 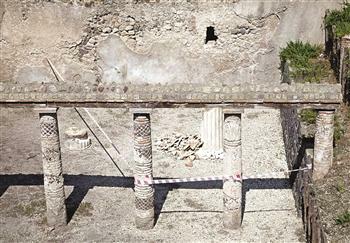 ITALIE – Pompéi - Part of the wall of a house in the ancient city of Pompeii collapsed November 30, raising fresh concerns about the state of one of the world’s most treasured archaeological sites. Officials said the wall was part of a 2,000-year-old house on the Vicolo del Modesto, in a section of the site that had already been declared off limits to the public for safety reasons. About two square meters (yards) of the wall were involved in the collapse, which occurred after heavy rain storms in most of southern Italy. The street where the collapse took place is located in an area of the dig that came to light in excavations in the 19th century. USA - Lake Vermilion - Before crews carve a campground into the pines and aspens -- creating 70 sites, many designed to catch ridgetop breezes -- planners will consider what archaeologists have uncovered during three seasons of work at Lake Vermilion, Minnesota's newest state park. The most talked-about find, flakes of obsidian traced to a cliff in Yellowstone National Park, surfaced two years ago. Archaeologists spent part of this season walking north-south transects 50 feet apart, recording the locations of 400 to 500 mining test pits that date to the late 1880s. Sometime this winter, Radford expects test results that will reveal what was consumed around a campfire near Lake Vermilion that radiocarbon dating showed to be 600 years old. It was likely the Dakota who built that fire. Deeper under the hearth, the crew found a projectile point, possibly from a dart or spear, dating back 5,000-plus years to the Archaic Period. Archaeologists' discoveries -- they'll continue to work at the site intermittently for the next couple of years -- will help to determine where development takes place, whether some sites should remain undisturbed and how the story of the 3,000-acre park is told. As Radford works the Lake Vermilion site, he envisions an interpretive trail that takes visitors through some of the test pits. Because the ground is rocky, the pits haven't silted in much since they were dug in 1880 during Charlemagne Tower's second prospecting expedition. That attempt involved geologists and men hired to shovel 3 to 5 feet deep -- through the glacial till to the bedrock -- and about 20 feet across. The iron in the rock renders a compass useless; the archaeology crew relied on GPS readings. "They never developed where we are recording these pits, so they must have not liked what they found," Radford said. "It was a strategic attempt at prospecting, and it was one of the first prospecting (attempts) that was done on the Vermilion Range." Iron ore was found near the surface at Soudan Mine, the oldest and deepest in the state. It operated until 1962, and provided the materials that built tanks for World War I and World War II. "All this other test-pitting that went on was also looking for that near-ground exposure of the ore body. They didn't find it, evidently, on Lake Vermilion, because they didn't mine that at all." Later testing -- park staff is working to pin down the date -- left evidence of about 10 drill casings on the Lake Vermilion property. Radford said one matches Diamond Drill No. 3, marked on a 1927 map. The way James Pointer sees it, the archaeological finds allow him to add another 9,000 years to the story of mining. The interpretive supervisor for both Soudan Underground Mine and Lake Vermilion, he sees a story in how people used tools. (An estimated 30,000 to 35,000 people tour the underground mine each year.) While the 155 obsidian flakes left behind -- likely during the making of one or two spear or arrow points from a cobble of obsidian from that cliff in Yellowstone -- predate 1736, the earliest written record of Bois Forte in the area, it isn't clear who would have made those tools. "It reminds me that there was a lot of trade and travel that was going on that you might not think was happening 600 years ago or 2,000 years ago," Radford said. "The people were mobile and didn't always just stick to one spot." More Native American history was uncovered in food storage pits near the lake. JORDANIE - The cultural heritage sites of Jordan are threatened by industrialisation, urbanisation and agricultural expansion, according to Sharifa Nofa Bint Nasser, president of the Friends of Archaeology and Heritage Society (FoAH). “Despite the fact that many economic developments such as factories, airports and roads are beneficial to the country, many were developed near these sites, causing environmental pollution, air pollution and even visual pollution,” Sharifa Nofa said at a lecture organised by the FoAH last week. CHINE – Xi’an - Archaeologists have found a large palace complex in the tomb of China's first feudal emperor in Xi'an, capital of the Shaanxi province. The site has been world-famous since the 1974 discovery of the Terracotta Warriors in the funerary pits. A researcher on the excavation told Xinhua News Agency that the palace of Qin Shihuang (259-210 BC) was composed of 10 courtyard houses and a main building with a total area about one-fourth the size of the Forbidden City in Beijing. Sun Weigang, associate researcher at the Shaanxi Provincial Institute of Archaeology, also said archaeologists had worked on the ancient buildings since 2010 and found that the palace in the tomb is 690 meters long and 250 meters wide with a total area of about 170,000 square meters. Despite warfare in late Qin (211-206 BC) and early Western Han (206 BC-AD24) dynasties and more than 2,000 years of natural destruction, basic relics including walls, sewers, doorways and rock roads remain intact, and even bricks and pottery pieces have been found. Sun said that the plane-mapping diagram made by the archaeologists showed that the ancient complex had a central axis and a main building, a layout in accordance with traditional Chinese culture. The historical record showed that Emperor Qin Shihuang planned the construction of his cemetery soon after he was enthroned, and the large cemetery and mausoleum showed that he wanted to continue his imperial life after his death. The emperor, who was born Ying Zheng, came to the throne of the Qin at age 13 and took over the affairs of the state at age 22. By 211 BC, he annexed six rival principalities and established the first feudal empire in Chinese history. The cemetery is located in Lintong district of Xi'an city, and the discovery of the Terracotta Warriors nearly four decades ago made it a hot tourism destination, visited by millions of tourists from home and abroad every year. UNESCO declared the army a World Heritage Site in 1987, and archaeologists believe as many as 6,000 clay soldiers stand in the largest of three pits at the site, which continues to be excavated. Archaeologists say that the newly discovered palace complex retains only its massive framework, but that largely intact pattern offers great value for the study of an ancient imperial palace and the development of human civilization.